Merced Dog Friendly Cabin Étapes vers le lac avec une cour clôturée double lot. Cozy Tahoe Style Cabin de 2 chambres sur un terrain double très bien situé, à seulement 1, 5 pâtés de maisons de la plage de Regan, une plage accessible au public avec une aire de jeux pour enfants et à 3 km de la station de ski Heavenly et des casinos de Stateline. Internet sans fil gratuit Il ya aussi une plage pour vos chiens dans cette unité animaux de compagnie. Boisé sensation sur le foyer permanent d'intérieur, gratuit et une cuisine bien équipée. Un endroit idéal pour votre prochain séjour à Tahoe. So why the 5 stars? I was there with my dogs, and the state of the furniture and carpet meant I didn't worry at all about them, even though my dogs are old enough not to be destructive. The short walk to the beach made us very happy, and we also made several trips to the Upper Truckee Marsh trail, which is accessed from Lily or San Francisco. The central air worked very well and kept us cozy in late November. The yard was plenty big for my dogs to run around and chase Stellar jays, and we even had a bald eagle perch in the tree by the driveway to eat his breakfast! For those with dogs, my 22-pound minpin could just about fit between the wrought iron fence pickets, so if you have smaller dogs beware. There is also a gap at the corner where the wrought iron fence and neighbor's redwood fence meet, big enough for my medium-sized dog to slip through if she wanted to. Other pros for the property: the kitchen and home were well-stocked and the only thing I'd wished they had was a hair dryer, since I did a few dogwalks with wet hair in 28 degrees. And their washer/dryer are full-sized units. Would definitely recommend this cabin for a small family traveling with dogs. Clean, Cozy & dog friendly w/dog friendly beach nearby! We had a great weeks stay. The neighbors were friendly and the location was perfect; near the lake/beach/dog friendly beach, and not far from great restaurants, shopping, grocery stores, renting bikes, fishing boat trips, casinos, etc. The only part that was challenging was finding secluded areas to fish with our dogs from the shore. There are places, you just have to do your homework ahead or some exploring and a little traveling to find them. The cabin was small but super cozy! It had everything we needed and was CLEAN! The double lot was securely fenced which was a plus for our dogs! I would recommend this place! My husband wanted me to mention we loved the kitchen, the beds were comfortable, and there is central heating which is nice! Great winter get away! Huge fenced back yard if you have dogs! This place is perfect for a small family. What was awesome was the huge backyard full of snow to play in. It’s nicely fenced to contain dogs or kids. We were very comfortable and warm. Thank you for the review John. We hope to see you guys in the summer as well!! I rented this cabin over super bowl weekend. The management was a pleasure to work with. The cabin itself was very cozy, well decorated and reminiscent of an older time but with modern amenities. My dogs loved playing in the snow in the large backyard. 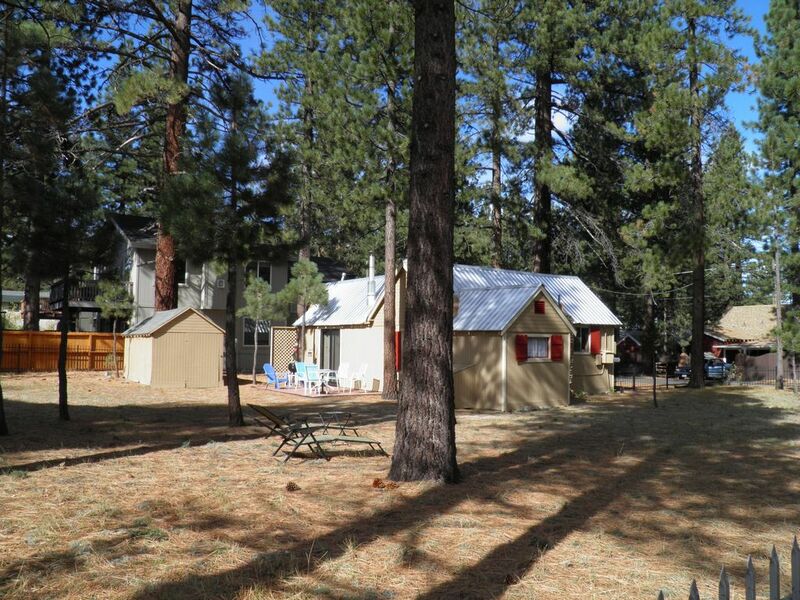 The central location and close proximity to the beautiful lake make this cabin special. I would highly recommend this rental for a couple of close friends or a small family looking to have a comfortable vacation in a wonderful area. This little 4 person house was cozy, very close walking to the water and a major beach. We were able to walk easily to rent kayaks. The kitchen was very well stocked with pots, pans, etc. We do wish there would have been a couple small fans available to help move the air. Otherwise I would rent here again if I had a small group.